We have decided to return to the bands original name The EAGLE JAZZBAND to celebrate we have produced a new CD “MEMORIES” which features our new line up. Like most bands these days we’ve had gig periods of Feast and Famine. So far we has been free from incident . That said,we have traveled far and wide but you can’t keep your contacts up unless you travel. It’s been a pleasure seeing so many old friends again. We’ve had some ecstatic receptions from some of our Saga and Venture Away audiences – but of course to get them you have to get the stage-presence. It can help if you’re wearing white tuxes! But when you get that response there really is no other feeling like it. Jazz is a performance art, after all, and the business of “entertaining” has to lift both performer and crowd. In other words, it’s deep respect for the traditions of classic jazz, our pleasure it certainly is! We keep adding bits and pieces to the repertoire, Tim has splashed out on a new kit with wood block. The collective experience amassed by the current line-up includes top UK theme parks, river cruises, cruise liners, major UK and European Jazz Festivals and Radio and Television broadcasts. The wide repertoire is drawn from popular songs from the 1920,s 1930,s and 1940,s Classic Jazz compositions by King Oliver, Louis Armstrong, Jelly Roll Morton, Sydney Bechet and Duke Ellington plus New Orleans Marches, Rags, Stomps, Blues, Swing and instrumental features. 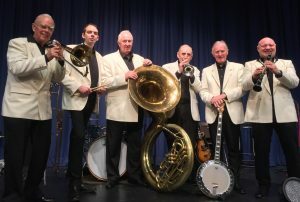 All band members are multi-instrumentalists, enabling us to play a variety of different sounds and styles each played in a happy, entertaining manner, many featuring vocals.